New – US Distribution of Saaz from Czech Republic!! Leah & George (Mostly Leah) have been working diligently with friends of relatives in the Czech Republic. George’s mother Rose Marie made the first contact last January looking for rhizomes. After months of government paperwork and red tape, we are now the sole distributor for BOHEMIA TOP HOP, a co-op of 6 growers in the Saaz region of the Czech republic. We will be getting 100 kilo (220 pounds) of Saaz pellets shipped to us next week (George likes to do things in a big way). We have a company coming to demonstrate a vacuum chamber sealer with nitrogen purge to custom package the hops in Mylar in any size you would want. Contact us at hippityhops@gmail.com or paul.hippityhops@gmail.com to let us know if your interested in purchasing Saaz! Orders over 5 lbs. Call George or Leah (651-462-2615) Or email Paul at paul.hippityhops@gmail.com for pricing. 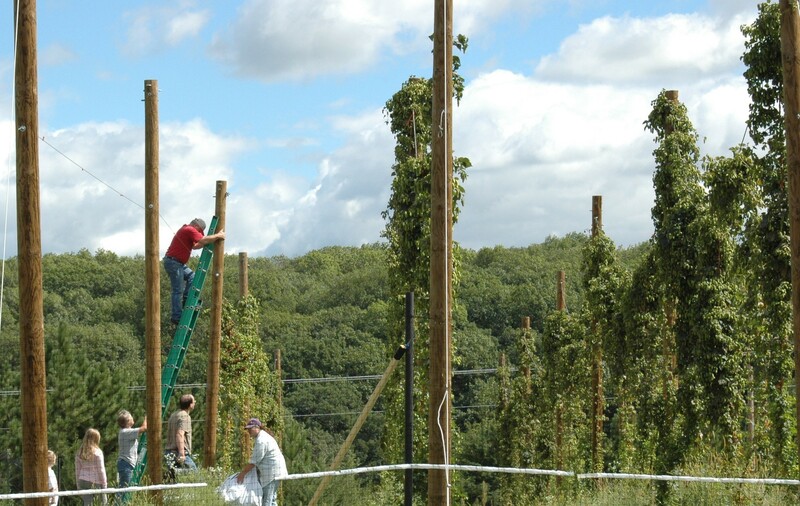 Harvesting our lines of Hops from the field. First of all, huge thanks go out to all the friends, family and neighbors who pitched in and helped with the 2010 hops harvest. 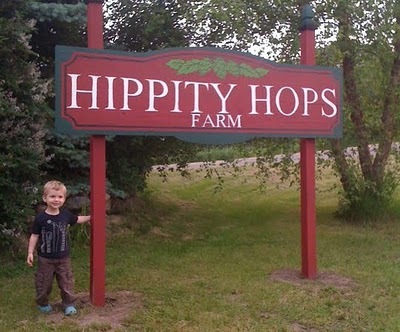 If it weren’t for all of you, Leah and me… Well Leah anyway, would still be picking hops. Even with all the help, we were up until 4 in the morning a couple of times. Their were a lot of good times had. Laughing, listening to music, eating, and than, of course, a few beers were drank also. The newly designed drying racks worked superbly. We were able to raise the temperature to 105* Fahrenheit (41* Celsius) in the hops house, and with the use of 2-48” fans moving the air, we dried about 20-30 lbs of hops down below 7% moisture in less than 10 hours! The last vine was cut down Friday night, and the last hop picked off and put in the hops house, dried, vacuum packaged and placed in the freezer the morning hours of 9/11 and those who know us personally are not surprised we are all very emotional for all those reasons. To see more pictures from the harvest Click here! So with a celebratory toast of Ale made with our 2009 Cascade hops. Leah & I will start planning next year’s expansion. Cheers, and enjoy the best; Minnesota grown hops! Hey everyone, we just wanted to say thanks to everyone who came out to say hello this past weekend at the Beer Dabbler Showcase! We had an absolute blast meeting you all and talking hops with you! Hopefully we’ll be seeing you all again at the winter showcase or perhaps sooner! We’ve posted some pictures from the event (granted not many, we were pretty busy talking with you all and consuming some amazing beers..) so be sure to go check them out on our Facebook page. New site, new sign , lot’s of stuff going on! Thanks for checking out our new site! We’re really excited for this summer as we have a lot of stuff going on! July 17th we will be setting up a booth at The Beer Dabbler’s Highland Beer Fest (www.thebeerdabbler.com/highland) to share some info about hops, our operation and to drink some great beers! July 24th we have Patrick from Hop Head News (www.hopheadnews.com) coming out to tour the farm and to ask some questions regarding the operation as well for a article on their site! We are very excited about all of the things we have going on as well as what the future may have in store for us. Keep checking back for updates and be sure to check out our Facebook and Twitter (links over to the right).